Is none other than Cinderella! So for Cinderella I kept trying to think of something for the sentiment. I was on the phone with my friend Linda, aka LGuild, and she is the one that came up with the sentiment. She told me I had to give her credit or she would smear my good name through the mud on the Cricut message board *okie has no idea why people think okie picks on Linda when it is totally the other way around*. Of pattern pink paper is SEI and is double sided with the flowers. The green is a bit of scrap I had of some Stampin Up. You maybe not be able to see unless you click on the pictures, but the pink flower paper has bits of silver in it and that is why I chose to go with silver brads on the card. I used the Stampin Up word window and modern label punches for the sentiment on the front. 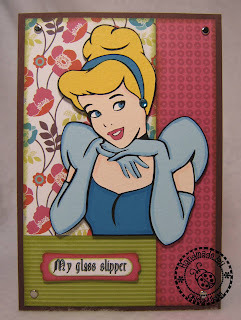 I did pop dot Cinderella and the sentiment. I didn't do a lot of embellishing because I was just too tired when I put the card together. But I think the use of 3 different patterns of papers does help with dressing up the card without adding other embellishment. For the inside I stamped some cherries next to the sentiment *okie starts to explain the use of cherries but then decides she will leave it up to the imagination of others*. 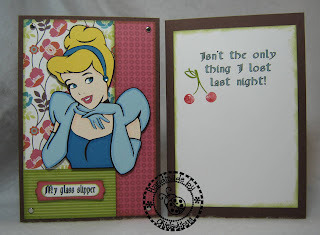 The cherry stamp is from Stampin Up Tart and Tangy. Well this winds down the Naughty Princess series! I hope you guys enjoyed it as much as I enjoyed showing it to you! Just too funny. I get the cherries! You naughty girls, yes you too Linda! 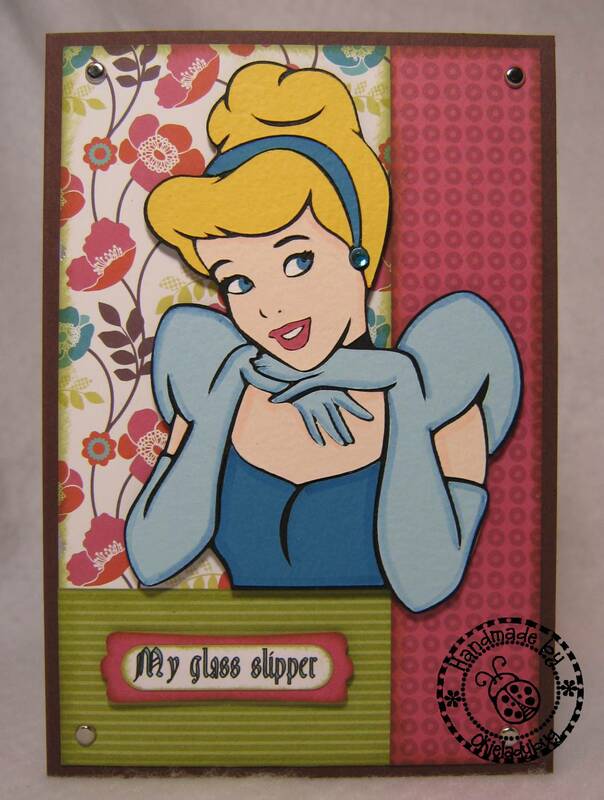 Cinderella card is my favorite, I just love the colors and the sentiment, good old Walt is, well really don't know what Walt is thinking at this time! But I do know I am going to miss the Naughty Princess series! Thank you Okie for taking the time to share, you're the best! Okie you and Linda crack me up! So funny! Great series! Okie Okie Okie -- What can I say. FAB CARDS. Love 'em. I'm not sure which one is my favorite. Im guessing this card isnt for a teenager or a kid???LOL!!! You always put a smile on my face....usually with your comments! I think you need to do another naughty series, maybe Seasme street, winne the pooh or Mickey and friends. Too cute!!! The sentiment is tooo funny!!! Great job again!!! So so So funny! Love it. I am liking these these princess a lot better. My favorite princess is Robert Munches' Paper Bag Princes. She rocks. Have you read that book? I love his children's books. Okie ... 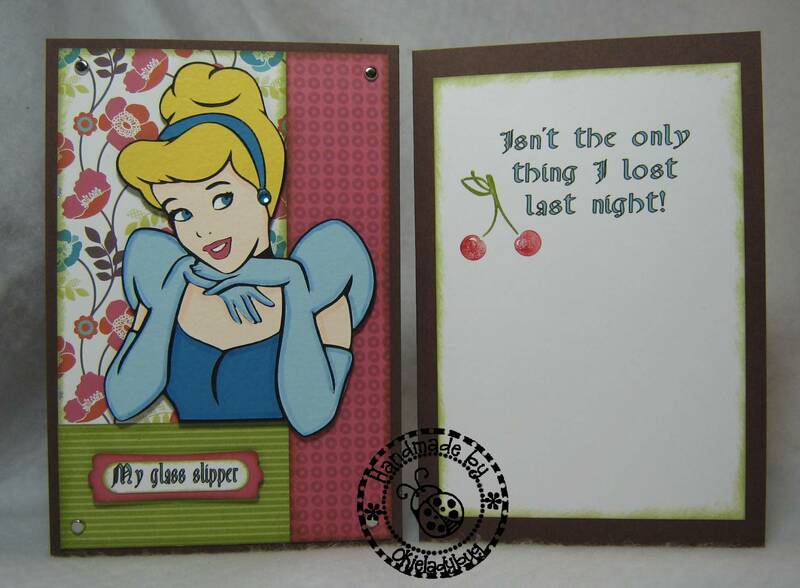 I totally love your series of Princess cards ... your wonder, and yes, sometimes warped, humor comes shinning thru! I have truly enjoyed the Naughty Princess series. Thanks or the laughs. You dirty woman!!!! Here is a suggestion for your next series? The Menopause Series? Okie, I just loved this series!! Now I HAVE to get those cartridges so I can make my own :) Great job lady! OMG!!!! LOVE THEM!!!! You did an awesome job!!!!!!!!!!!!! I am still LMAO!!!!!! OMGoodness! So Linda is worse than you?!?!? Who would of thunk? Geesh...I have a whole new outlook on my Disney Princesses now! I have loved this series! You are too funny!! Ah, damn! The thought of the cherries are now engraved in my brain :) Totally enjoyed this princess series, Okie! Wonderful job as always. I think I like this one best of all! I may lift this one, add some cherry paper on the front instead of flowers, reword the front sentiment . . .
"So I heard your glass slipper . . .wasn't the only thing you lost that night." and send it to a newlywed who is already expecting!! Oh, man! I'm wondering if SU will revoked your purchasing privileges for using their Tart & Tangy stamp on a risque` card! ROFLMAO! I think that's a perfect sentiment for someone that looks that smug! Sort of like the cat that had the cream! Haha!!! Too funny, I get the cherries! OH MY!! I know where to go for lots of laughs!! Thanks! Now I could so see me giving this one away. Love the sentiment. Great job on all of them! You are just too funny! I love the naughty princess series! Very creative...lol. I KNEW IT! She kicked that slipper off on purpose. Another saying could be, If my pumpkin is rockin,don't come knockin. I totally enjoy your princess cards!! Girl, you are too funny!!! I will miss the naughty girls but I had fun (and a good laugh) reading each and every card! Another winner. Thanks for sharing your great sense of humor. I now have a whole new use for my Disney carts. Thank you for all of the laughs. You are too funny!!! I just love your sense of humor Okie!!! Thanks for the laughs!! You tell Linda that we're on to her. You have such a sense of humor and it always shows...love the naughty princess series! TFS! I just love love Disney.....so I have to say this series had been so super cute!! LOVE THEM!! I'm sad to see this series come to an end!!! You had me crackin' up! :) Too, too clever! hahaha! how the heck did I miss these when you first posted them?! love all of them!! You have made my day. I have been laughing at the naughty cards an then reading the comments and laughing at them. TFS and designing them.